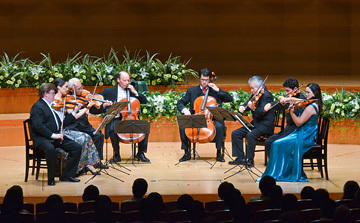 Nippon Music Foundation organizes concerts to provide opportunities for as many people as possible to enjoy the superb sound of the stringed instruments played by the recipients. The Foundation organizes "All Strad. Concerts" worldwide using more than 10 Stradivarius instruments played by the recipients. These concerts offer unique opportunities to enjoy chamber music by the world renowned soloists. The concerts have been presented at prestigious concert halls and museums such as Suntory Hall (Tokyo), Mozarteum (Salzburg), Louvre Museum (Paris) and Galleria dell'Accademia (Florence). 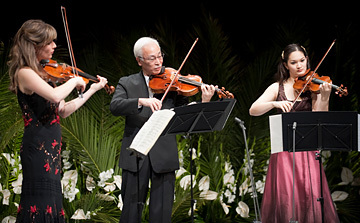 Domestically, the Foundation has been making efforts to present concerts in the regional areas across Japan where people have limited access to live classical music performances. These concerts include charity concerts and the full proceeds from these charity concerts are donated to the local organizations to help local communities. Where the donation goes and how it is used are made public in advance. This enhances the ticket buyers' motivation for being part of the charity, and contributes to the fostering of the charity culture in the local community. Nippon Music Foundation provides grants-in-aid to musical projects including concerts, workshops and seminars. These projects aim to present masterclasses, enhance international cultural exchanges, promote public interests in music, and foster charity activities through music. Through close communications with global music institutions and conservatories, Nippon Music Foundation aims to further develop international networks of music. The Foundation hopes to utilize such networks to support the making of new stringed instruments, to promote technical exchanges for the repair and conservation of stringed instruments, to hold symposia, and to support international music events and competitions. Nippon Music Foundation conducts basic surveys and studies to foster public interest in music. The Foundation collects materials related to music including books, printed matter and recordings for the future establishment of a music information library.